M-A-N-Y many years ago I took some college classes in weaving. I recently ran across several projects that had been long stored and thought I'd share them. 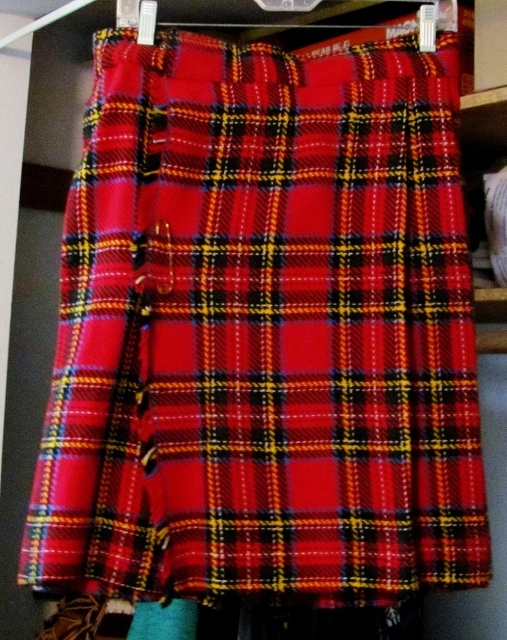 This is a kilt I made for my hubby in his family's tartan (Royal Stewart). I wove 6 yards of fabric, designed and made the kilt. 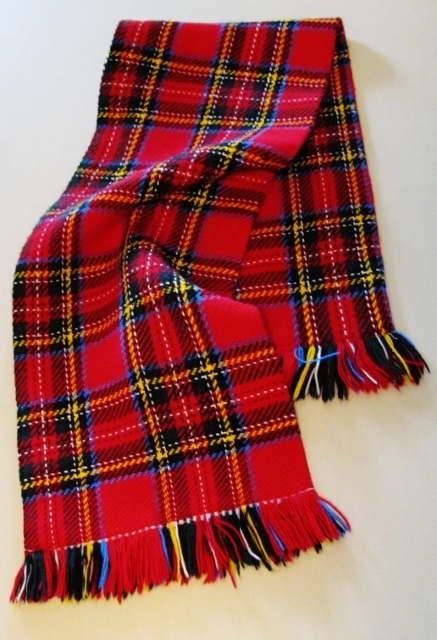 There was enough yardage left that I made a miniature kilt for our son (about age 1) and this neck scarf for my father-in-law. My weaving was back in the day when long skirts were the thing. I made this houndstooth weave for my mom. This skirt I made for myself - plain weave with a border of pattern weave at the bottom. I made baby blankets for each of my kids but don't have either of those handy to show. I do have this wall hanging that I made with 100 handmade brass bells woven in. I do still have a floor loom but have not had a project on it for at least 25 years. So many hobbies, so little time. Oh, the joy of looking through huge boxes of old photos with adult children! Many memories, laughs and stories later, I pulled out a couple of art projects from 'w-a-a-a-y' back to share with you. More than 30 years ago I made this wall hanging for my folks. It is an image of Multnomah Falls in Oregon. I wrapped a metal hoop with yarn then used a needle to string a warp of yarns vertically. This became the base for a tapestry weaving for the background. The falls themselves are in freefall made of a slub yarn. The trees are made in a rag rug style by tying tufts of yarn onto the base and then trimming them to shape. 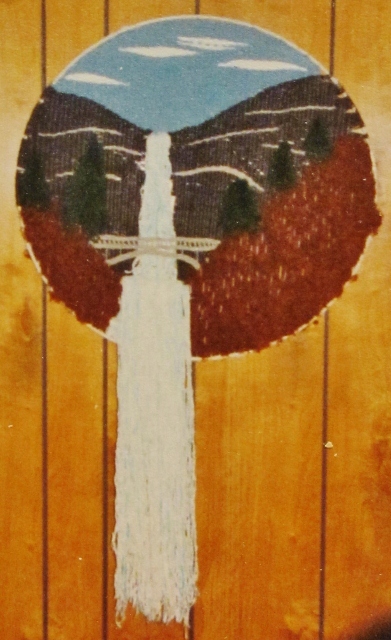 The bridge - an iconic part of the falls view - is crocheted. Sorry about the quality of the photo as it is a digital pic of a printed snapshot. I used to do a lot of weaving back in the 70's and may show some more of those projects along the way. I still have a few of them after all these years. I still have my floor loom, too, but haven't had a warp on it since about 1983! Halloween has come again and we were off the other nite to a costume party. We always try to go as a 'couple' with costumes that are tied to one another and this year was no exception. 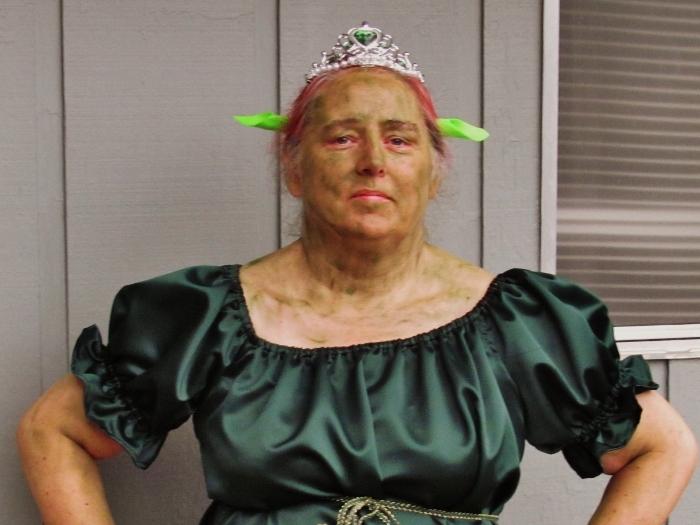 We decided to go as Shrek and Fiona. 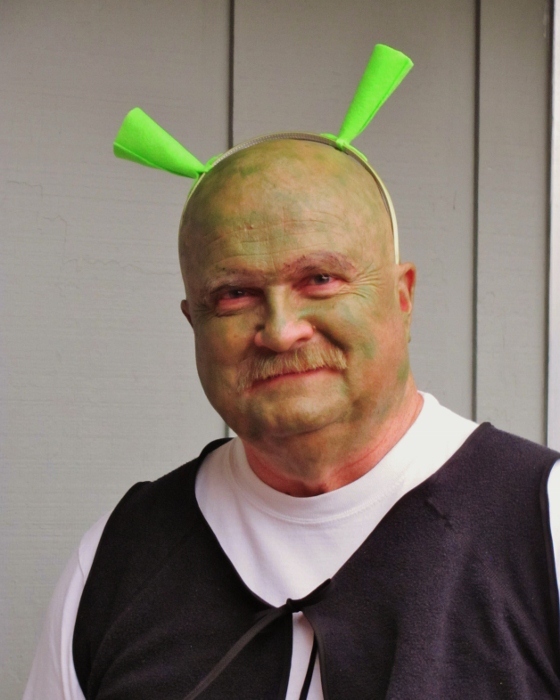 Hubby shaved his head for the green face paint and I made him 'ears' of green felt mounted on a green child's headband. Tan pants and black boots were topped with a white long-sleeved tee. 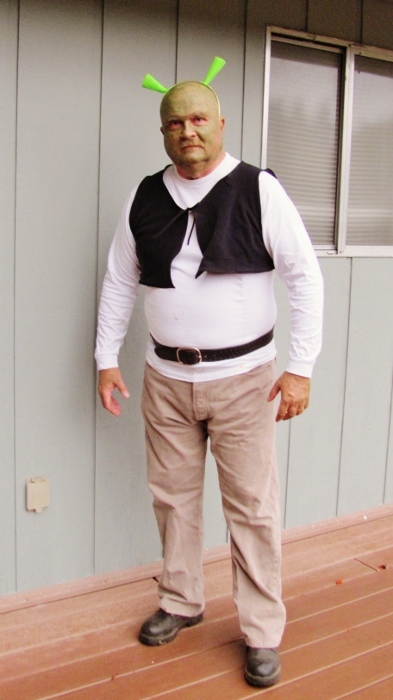 He wore his belt on the outside and I made his cut-down vest out of an old black sweatshirt. I cut away the sleeves and neck and shortened it before binding all the edges with bias tape. 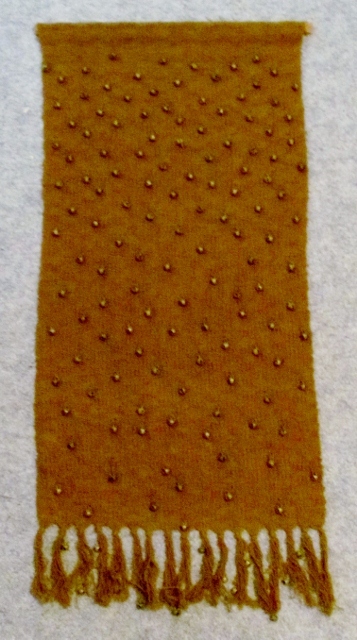 The ends of the bias tape were used to tie the vest closed. I made more of my costume by using a satin fabric to sew a dress based on a pattern for a peasant blouse. I simply lengthened it and then used some decorative trim as a tie to create an empire waist. I created the headpiece by coloring the stones on a child's crown with alcohol inks (they started out purple) and attaching the 'ears' made from green felt with hot glue. I sprayed red coloring in my hair and used green face paint (horrible stuff - always turns out blotchy). Simple black shoes were all that it needed for completion of this outfit. Anybody should be able to hear with forty-four ears! 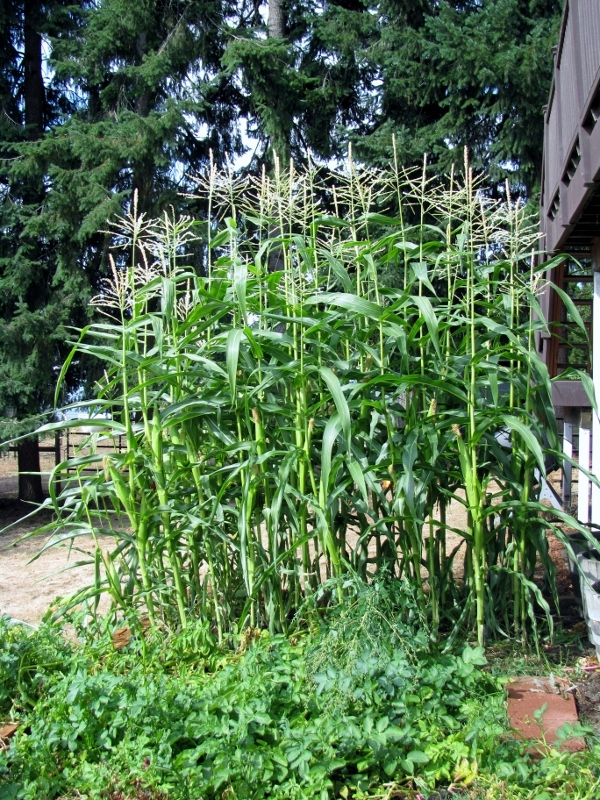 I got FORTY-FOUR EARS OF CORN in my garden. I've mentioned before that this is the first time I have grown corn and I am totally jazzed that this crop came out so well. 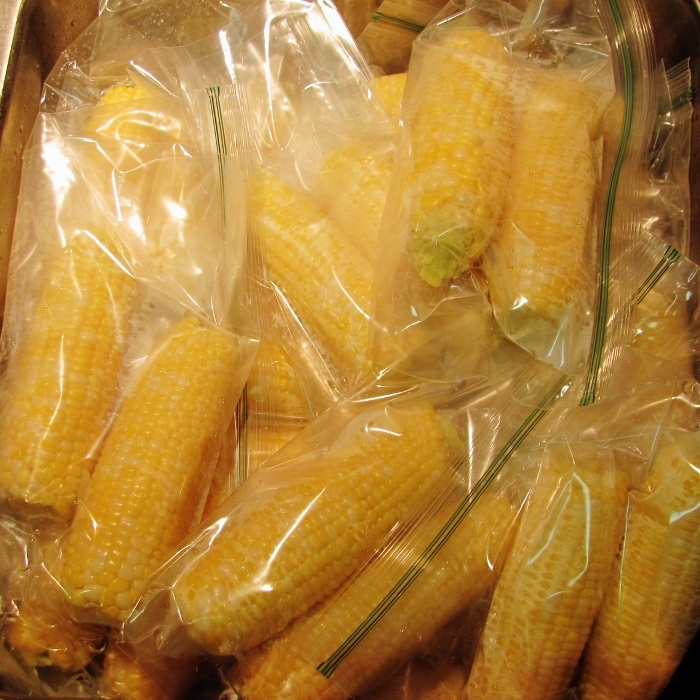 I blanched it all and froze it on the cob. That's the way we like it and it will be great having corn on the cob all winter long. I harvested my first plant of purple potatoes! I had no idea what size they would turn out and I was excited to see that they are at least as big as the russets. Not sure how I will be cooking these - first I have to admire them for a few days, though. Wow! The whole summer flew by and I forgot to show the progress of the garden. So much of the produce has come and gone that there is not much to show at this point but we are still eating from it and a few things are just coming into their own. Tonight we had spinach, beets, cherry tomatoes, cucumbers, green onions and potatoes from the garden for dinner. I have white onions in the crisper, too. The deer ate the strawberries right down to the stems and the blueberries produced two berries this year. No raspberries at all. None of the garlic came up. 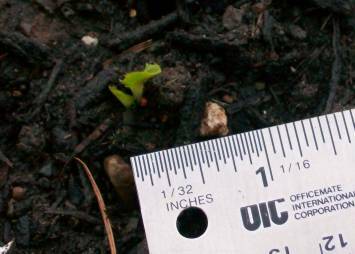 Lettuce did well but the deer snacked on that, too. Radishes did like every year - about half a dozen created radishes and the rest went right to seed. A re-planting did even worse with no radishes produced at all. Green beans did good, peas did fair and sugar snap peas did dismally. 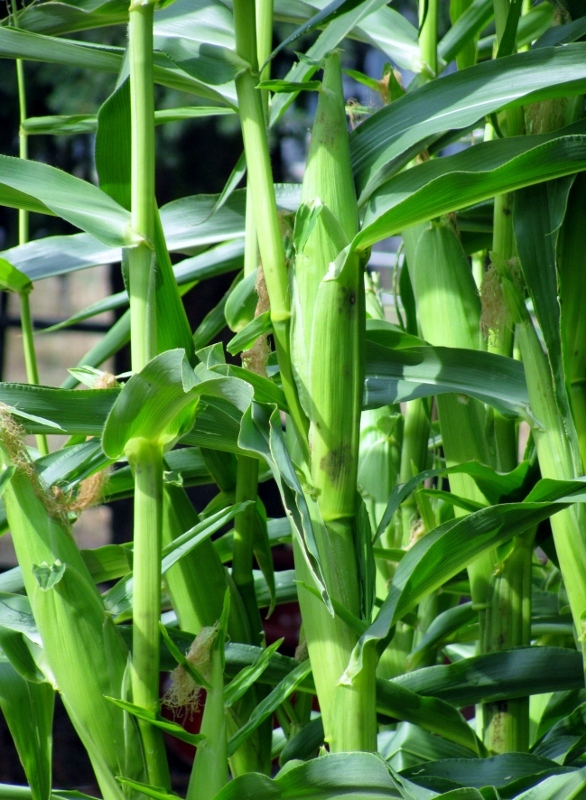 and, finally, sweet corn - this is the first time I have grown corn, too. It is doing GREAT! We'll be eating on this garden for quite a while yet. Just ONE (OK, technically 4) more Christmas project to share. 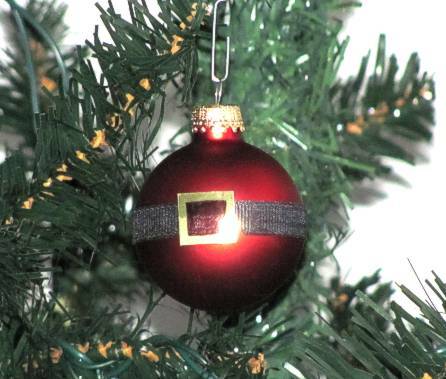 First up is the set of ornaments I made. I got the idea for these from one of the blogs I follow and actually bought the balls to make them with. I started with 6 red satin-glass balls, used glue dots to adhere a grosgrain ribbon around and attached a square of gold metallic cardstock to cover the seam. The center of the buckle is colored in with Sharpie marker. I did not have any black ribbon so I colored some cream ribbon with black alcohol ink. The rest of the projects involve food - for the Christmas brunch we went to. 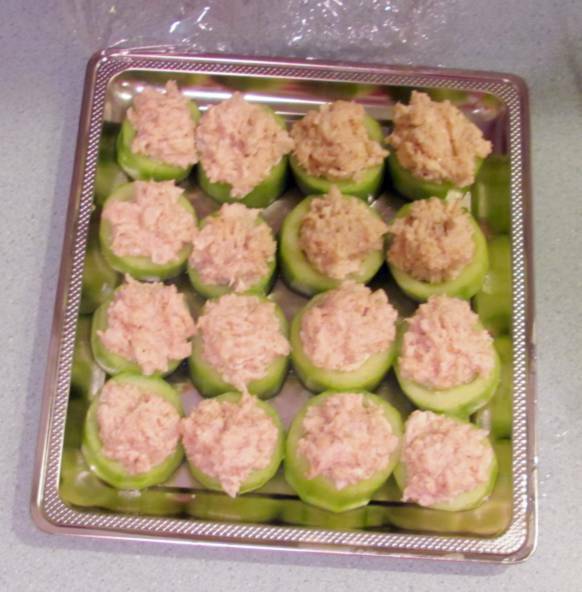 I got the idea to make cucumber cups from a magazine but changed it up by peeling mine and making a filling of spicy crab salad for the filling. The centers are scooped out to make the cups. 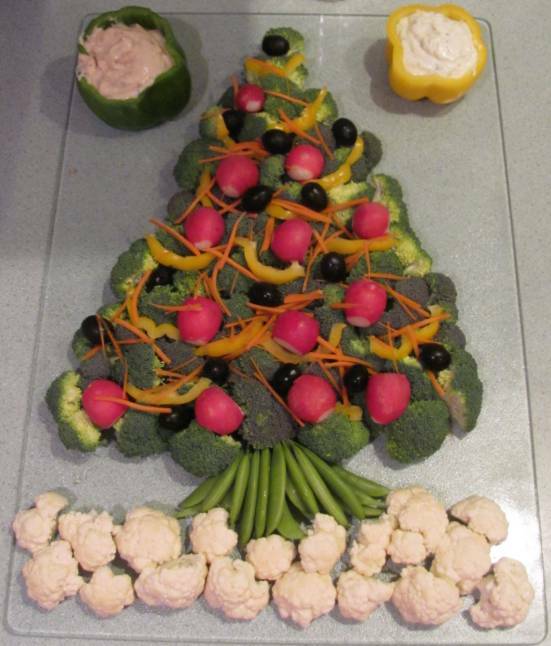 Then from Google Images I got the idea to arrange the veggie tray as a Christmas tree. I used cauliflower for the snow, snap peas for the trunk, broccoli for the tree and decorated with yellow bell pepper strips, radishes and black olives. I shaved carrot over the top for color and served two kinds of dip in hollowed out bell peppers. 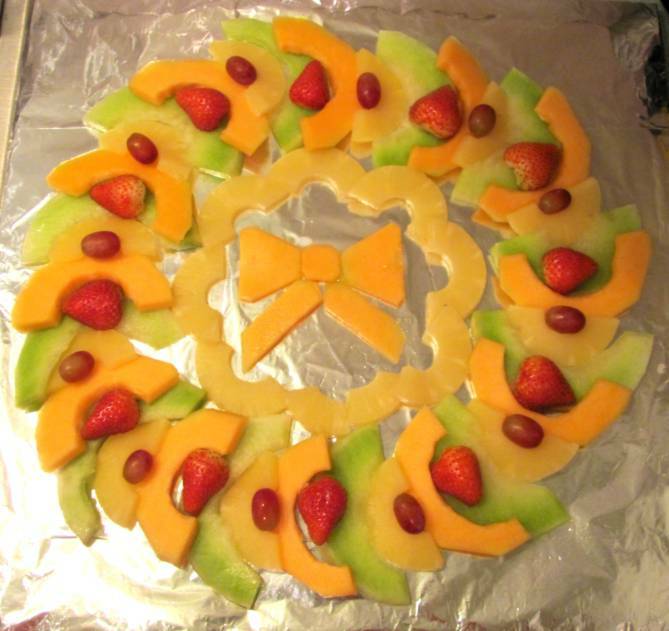 I made a wreath for the fruit tray using cantaloupe, honeydew, and pineapple rings (cut in half). The pineapple centers each got a grape and the spaces between these got half of a strawberry. I cut slices of the cantapoupe and carved them to make a bow for the center. 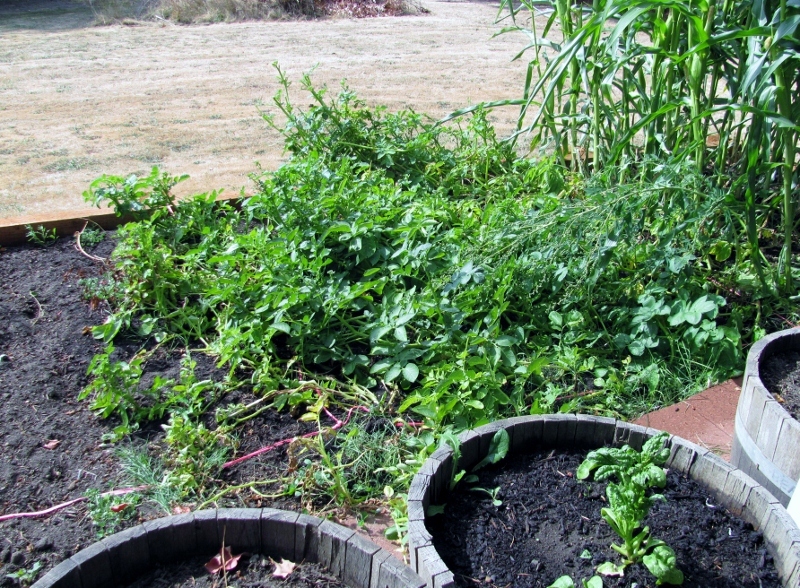 This year's garden was a dismal failure! I attribute this to the cold and wet spring that lasted through June. I did have success with beets and cherry tomatoes, with sweet onions and green onions. Everything else either came up and had a weak production or the seeds didn't even sprout. 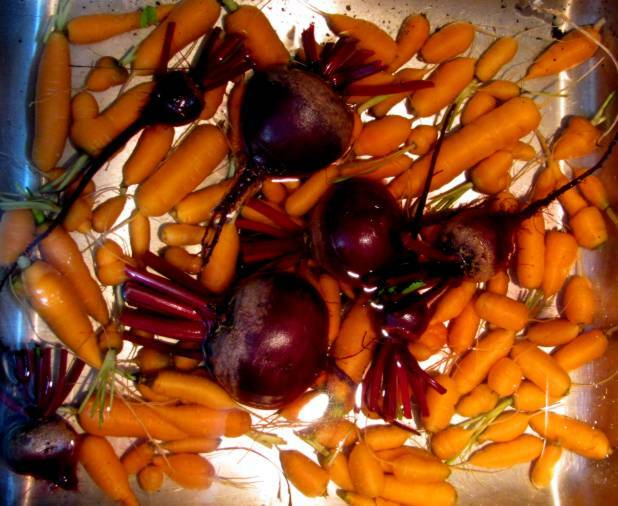 For example, here is a photo of my entire carrot harvest. This is from a single oak barrel (all of my garden is planted in these). They carrots looked great from the top but when I pulled some they were very stunted. I ended up pulling the whole crop and only one carrot was over 2 inches long. I scrubbed them and grated the whole lot which made enough for 12 loaves of carrot-pineapple bread. The photo also shows the beet harvest minus the two I pulled earlier in the summer. 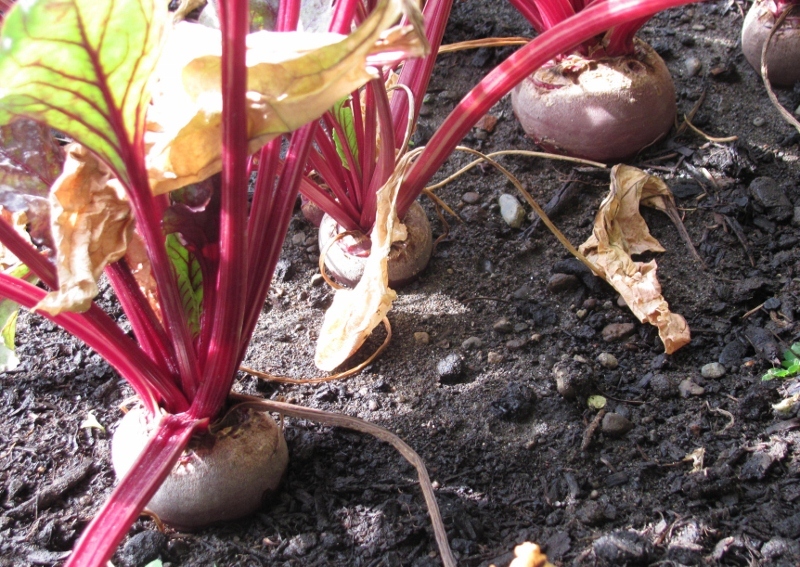 These were some tasty beets, too. I boil them in the skins, plunge into cold water, slip the skins, slice, saute in butter, season with salt and pepper. Just like candy! Next year had better be a good harvest or I may have to give up on the whole gardening 'thing'. Either I'm not good at it, the oak barrels are not suitable, or it takes more time/attention than I am giving it. Since none of those variables are going to change I have better things to do with my energy than fuss over vegetables that don't want to cooperate. 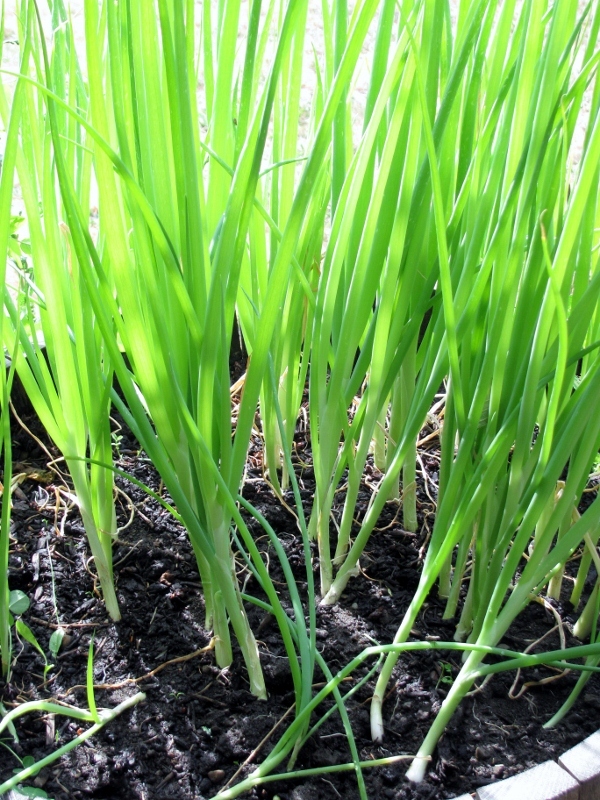 A couple of new things this year: I put in both sweet onions and white onions in addition to the green spring onions. And for the tomato selections I went to a high yield cherry tomato, a roma, and an heirloom mix. 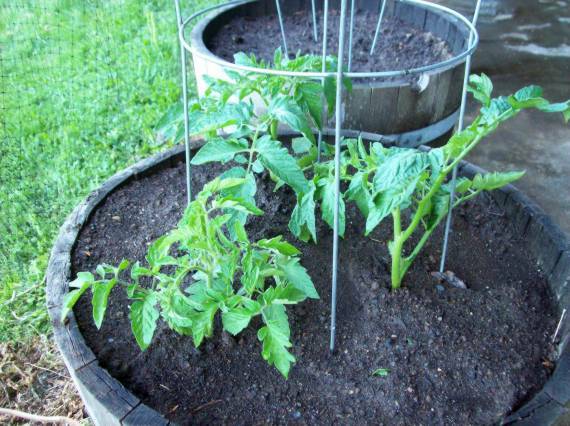 I am going to try growing the larger tomatoes in the hanging planters I've seen on TV. For the time being I have them in starter trays and will move them once they are established plants. 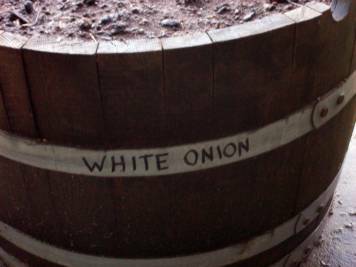 As I was weeding the barrels in preparation for planting I was fascinated by the way each barrel has it's own little specialty in the weed department. One barrel is heavy on the thistles, another has these weird weeds that 'pop' and spray seeds when you touch them. Then there are some kind of vines that have purple flowers and a real sticky stem, and in yet another barrel there are milkweed. I've found grass in some, too, but the most FUN is finding the walnuts from across the road that the squirrels have buried in the soil. A few of them sprout but most are just hanging out. This year I found three of them. I have this little voice in the back of my head that insists it is cheating to call it gardening if you buy plants half grown and just put them in the dirt. Even more so if flowers are blooming in your garden at the moment you cover the roots with soil! 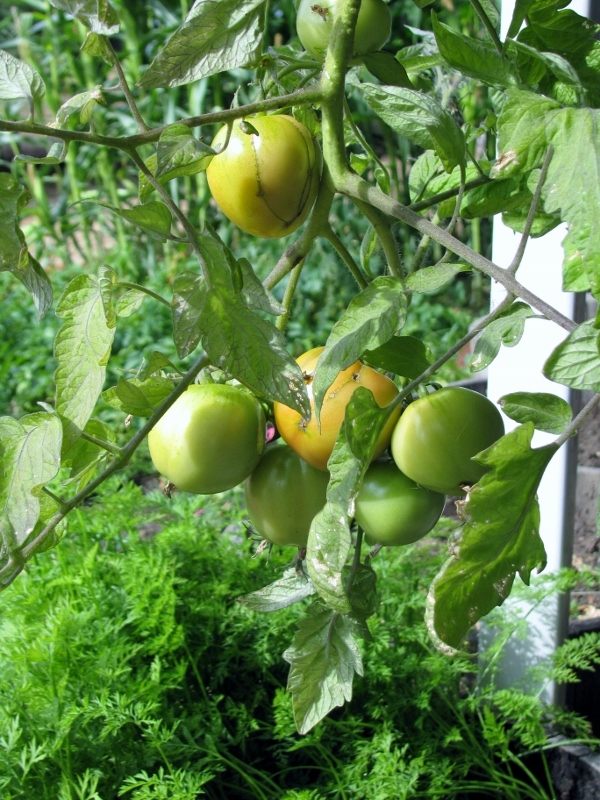 Alas, I have delayed so long in planting my garden this year that I stooped to the depths and bought tomato plants to plop in the ground. I'm SO ashamed (but hopefully will have tasty tomatoes out of it). 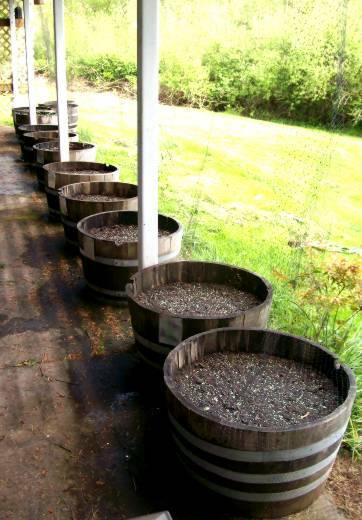 However, the rest of the barrels (11 of them) have been planted with their little seeds in the manner of proper gardening. I planted on Monday afternoon. Here on Thursday afternoon I have three barrels sprouting. I did all the lettering with a chisel point marker upside-down leaning over the barrel! Pretty good, huh? This last weekend was a ladies event at church. 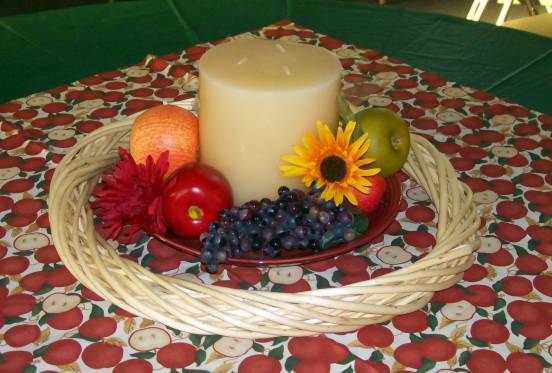 I was asked to do the decorations and chose to do an 'apple harvest' theme. The fabric was from JoAnn Fabrics, the candles I had left over from a previous project, and everything else (frupt, plates, wreaths) was from Dollar Tree! Hubby and I have been playing with blocks! BIG blocks. 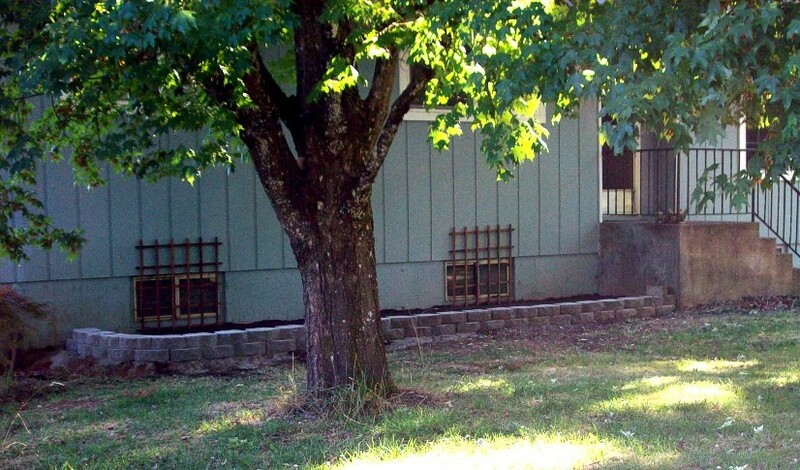 After living in our house for over 18 years we finally decided to put in some landscaping in the front. We started last weekend and finished this new flowerbed today. I will be planting ferns in back, hostas in the center, coleus in the front. We want to have some color and it is in perpetual shade - all seasons and all times of the day. I still have to research the best time to plant all of these, but when the time is right WE ARE READY! There is a certain fascination with birds, and I watch for different ones wherever I go. Around my own area I log in my copy of Familiar Birds of the Northwest (Harry B Nehls) with the date, location, and something about their activities. I log each bird only once - the first sighting. My husband fancies me a gardener. However, I grow nothing successfully as far as houseplants (including cactus), or landscaping. 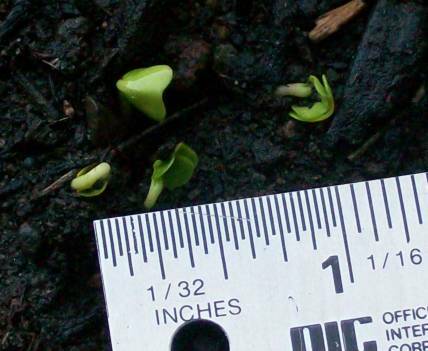 I'm also the only person alive who cannot grow zucchini! 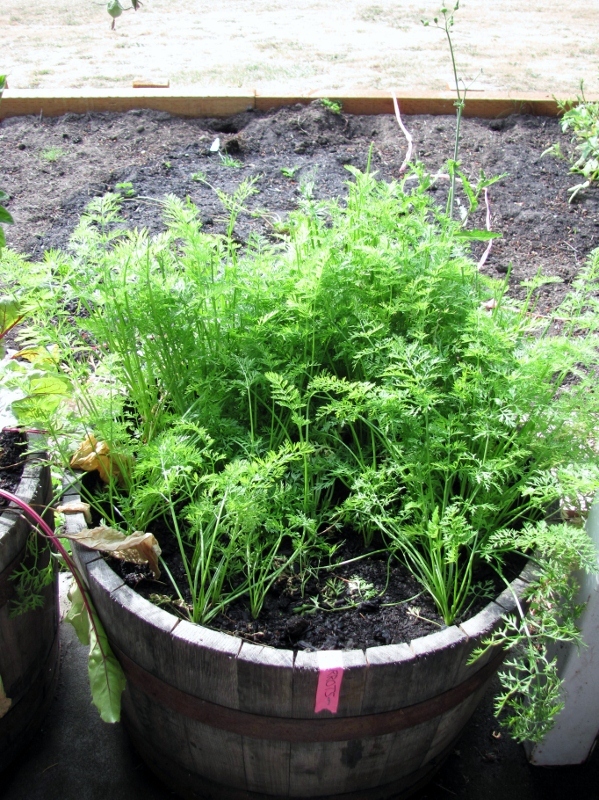 A few years ago, said hubby brought in several half-barrels and filled them up with good garden mix. I have a modicum of success growing a few garden vegetables each summer - except any kind of squash or melon. This year I added some little pots with herbs. Here's the lineup this year: carrots, yellow onions, green onions, sweet peas, parsley, sage, beets, green beans, rosemary, radishes, thyme, beefsteak tomatos, cherry tomatos, marjoram, cucumbers, basil, spinach, and lettuce. 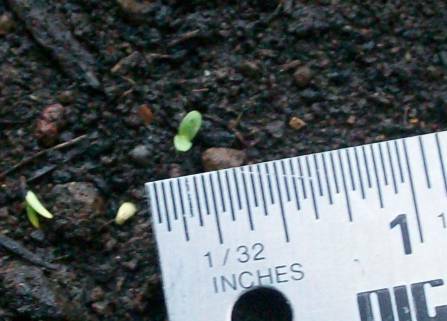 The radishes and spinach are starting in on their second crop. Are you going to be entertaining this summer - or have you been asked to bring a dish for a get-together? My son gave me this recipe for a spicy relish to be eaten as a dip with tortilla chips. Oh Yeah! This is good! 2 jalapeno peppers, deseeded and chopped. Drain & rinse all wet ingredients, combine with chopped ingredients. Pour in dressing and mix well. Marinate at least overnight. Drain and serve with tortilla chips. Makes 3 to 3.5 quarts. I mentioned a couple of days ago that I collect two things. 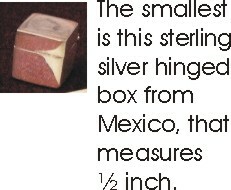 The first was foreign coins and the second in boxes. 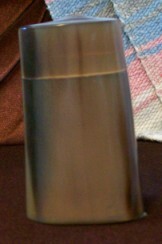 It started out when my dear hubby and I were dating and he bought me this box with a gift of perfume in it. Like the coin hobby by husband buys be boxes as gifts and I buy them wherever we travel. Family buy them for me and many have been hand made as well. 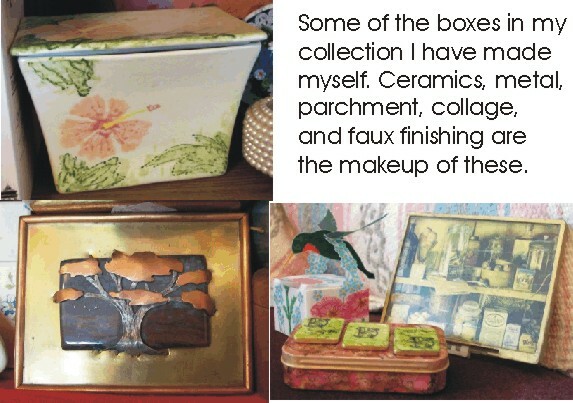 In fact, I have made a number of the boxes in my collection. There are two things that I collect. One of these is foreign coins. I think the whole thing started when my mom got a Bolivian penny in some change back when I was a kid. 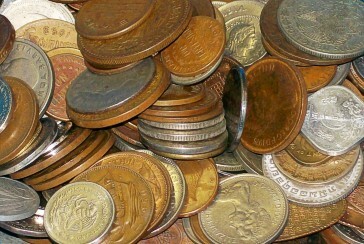 Coins have held a fascination for me ever since. I pick them up when I travel, friends send them from their own countries and my husband buys them for me from a local coin shop. 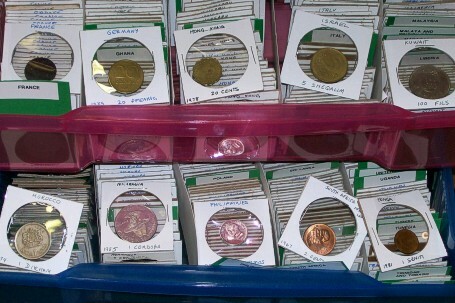 The shop only really deals in US coins so when they get foreign coins at estate sales and such they just toss them in a box and sell them by the pound. I sort the coins by country, then by denomination and save only one of each issue style. Whatever I have left in duplicates I use in crafts or donate to the Boy Scouts to use in their merit badges of coin collecting. 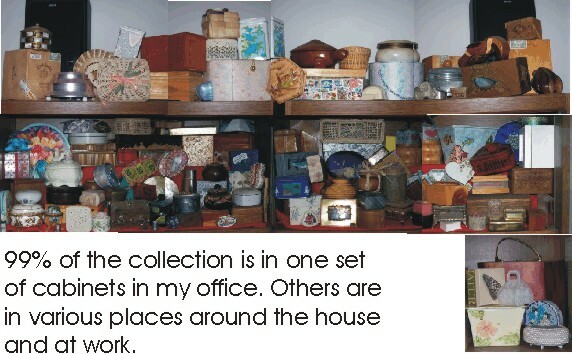 The ones I keep are marked in my catalog and filed in coin holder in drawers. I also keep a computer log of countries and the number of coins I have from each one. At last count I had 1179 different coins from 121 countries. I do collect a few US coins. Mostly the state quarters, the presidential dollars, the westward nickels, and very antique coins. I'll tell you about my other collection another day.